On December 19, Tuesday, "Embassy of Musical Mastery" is coming back to Rabat. 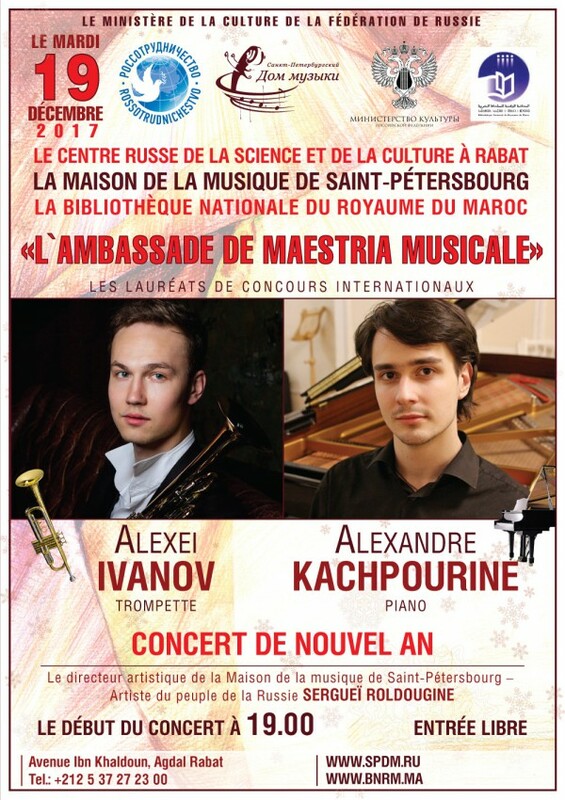 St. Petersburg Music House and Representative Office of Rossotrudnichestvo in Morocco invite to the National Library of the Kingdom of Morocco for New Year's Concert of young soloists, laureates of international competitions Alexei Ivanov (trumpet) and Alexander Kashpurin (piano). The audience is waiting for true musical carnival, which will bind together many compositions of different countries. The music of Russia will be presented by masterpieces of Rachmaninoff, Scriabin and Vasily Brandt. Musical traditions of France will reveal pieces of Ravel and Arban, and Hungarian music will be presented by pieces of Liszt. This unique concert program will also feature pieces of prominent representatives of other national schools: Latvian Jazeps Vitols, Armenian Alexander Harutyunyan and Romanian Grigoras Dinicu. Alexei Ivanov, 22 years old. He is the student of St. Petersburg Conservatory (class of Associate Professor Boris Taburetkin). Winner of International Rimsky-Korsakov Competition (St. Petersburg, 2017). Since 2014 – artist of Mariinsky Theater Orchestra. Member of Music House Programs since 2011. Alexander Kashpurin, 21 years old. He is the student of St. Petersburg Conservatory (class of Honoured Artist of Russia, Professor Tatyana Zagorovskaya). Grand Prix Winner of Russia-wide Benditsky Competition (Saratov, 2017) and International Vitols Competition (Latvia, 2017). Member of Music House Programs since 2013. Address: Rabat, Prospect Ibn Khaldun. Agdal. Phone: +212 5 37 27 23 00. "Embassy of Musical Mastery" – a unique project of the St. Petersburg Music House and "Rossotrudnichestvo", which takes place since 2012 and includes the creative meetings of leading Russian musicians, as well as tours of the young soloists at the Russian Science and Cultural Centers abroad.